Watching matrons dance in religious frenzy is not my idea of a Saturday night well spent. Though it does remind me of the night spent in the Arabian desert, watching a belly dancer seduce a corpulent Scottish troupe. I mean the carpets are an almost exact replica. So are the garish lights and the sense of watching something so alien, that whatever the quality, it will be attractive. Except that the latter isn't true for today. I'm watching a dhunuchi competition, which is an event where individuals and groups hold chalices full of smoking embers from coconut husks and sway. Sometimes, they jut out their hips. Mostly, they take three steps forward and three back. Yet, it's the opposite of unison. They do this in front of the Durga idol who watches them without flinching. Wonder what the real Goddess would have done about such misguided lack of talent? 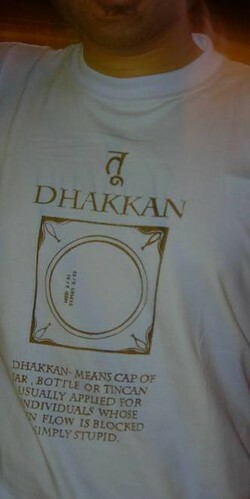 The rhythm is provided by a dhaaki, or the drummer who is the saving grace of most such events. The spectacle is bad enough when the young try to attempt the sway. It becomes far, far worse (I am trying to be very polite here) when the old try and match them. From their faces it can be seen that they are dancing a nimble dance, but the body doesn't keep up. Today, an young lass wearing a denim miniskirt provided some hope to the crowd when she started out in a Himesh pose (the dhunuchi replacing the microphone!). The hope was entirely misplaced. Even the relatives of the other dancers gave up. Someone started announcing the forthcoming cultural programme at that very moment, thus providing enough distraction to a lot of the watchers to make an exit. Dhunuchi competition was over, at least for me. No, actually, Delhi. But I guess this is common to all Puja pandals.